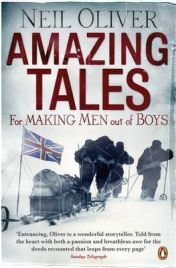 “There was a time not so very long ago when boys were taught to be men” writes author, archaeologist and broadcaster Neil Oliver, and “part of the education of boys came from reading tales of brave and selfless deeds”. Not so any more. “It’s rubbish being a British man at the moment…nowadays the rest of the world sees British men as the performing seals of George W Bush’s Wild West Show. We’re the sick men of Europe too with our lazy fat guts and our binge-drinking.” He also opines that nothing grand or challenging that we do now is simply for the sake of it; nothing is important unless it is done live on air or filmed to be broadcast to the masses – perhaps a strange complaint from a man who makes his living from such media. But while being an archaeologist in Scottish winters, growing hero hair and appearing on TV in armour and wielding swords may be a little bit manly, Oliver is more interested in manliness on a much grander scale and how stories about such manliness could be an antidote to his despair for the youth of today.